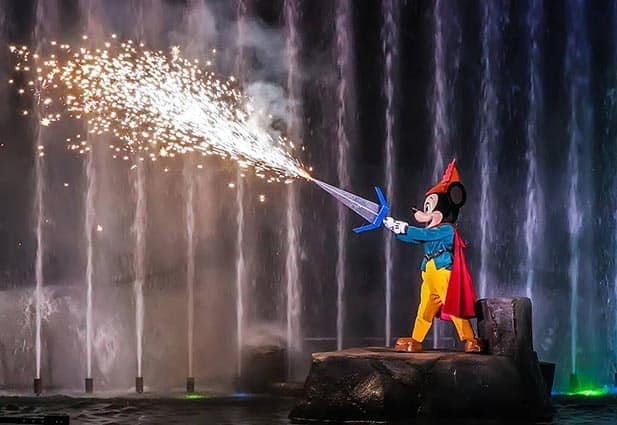 What do you get when you combine water fountains, projections, pyrotechnics, live entertainers, a terrible nightmare, Steamboat Willie and the Sorcerer’s Apprentice? None other than the amazing nighttime spectacle at Disney’s Hollywood Studios called Fantasmic! In this nighttime production, Mickey has been dreaming about many of his Disney pals, but he begins to have a nightmare, and it’s scary! As he has his nightmare, scenes from different Disney feature films are shown as projections against screens of mist, and Mickey also comes face to face with several notorious Disney villains—Cruella De Vil, Jafar, Scar, Hades and more. He must battle Maleficent, who morphs into a huge fire-breathing dragon that stands four stories tall! The ending alone is worth your time. You’ll even see such Disney characters as Steamboat Willie and many others that you aren’t able to see anywhere else in the parks. Be sure to have a FastPass+ time for the show so you can get the best seats!